Christiane Northrup is a gutsy doctor that has been leading the way toward more holistic women’s healthcare for 30 years. She has a lot to teach us. In her most recent book, Goddesses Never Age, and a fabulous accompanying video series, The Ageless Goddess Online Course, she is taking on the bullies of the ageist gang. 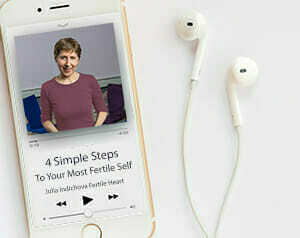 Many of the ideas she shares in the series echo the teachings of the Fertile Heart OVUM Practice and the ideas I shared in The Fertile Female. Beliefs, thoughts, feelings drive the engine of our lives. There is also a whole lot more in this video series that I imagine you’ll be watching over and over. If you click on the video, it’ll take you to the page with a lot more details on what to expect from this wonderful “ageless goddess,” teacher, wise woman who has been inspiring women around the world with humor and intelligence for over 3 decades. In her wonderful forward to Inconceivable, Dr. Northrup wrote this about my book, and it certainly applies manifold to her work and this latest video series. Here’s to staying fertile and creative and busy being born! I was disturbed by this as it reinforces that any age(just a combination of digits) identifies who you are, what you can or cannot do, what experiences you have. Now I know all of us in the FH community can probably give completely different numbers for any of these categories but more importantly- maybe there is no definitive age to do or have any of this and more. Donning a bikini on a beach vacation you’ve saved up for your whole life shouldn’t be frowned upon because your numbers are above 48 or that your peak happiness is slated to last one year in your 30s. Thus, any of us fretting over becoming pregnant at an “advanced age” should be redirected to the notion that our age is merely a symbolic marker of our life’s journey, experiences and the love we have accumulated thus far. It is not a written law or rule that defies our maternal power. Well said Lori! I found those numbers to be insulting and demeaning. So I am too old to be happy and I should be ashamed for not being average? thank you for sharing this Julia. MH shared a link in the forums with her not too long ago and I love how she points out that she helped deliver a ton of babies from moms in their 40s when she trained in a catholic hospital. When I was in nursing school in the maternity ward I took care of a mom in her 40s and she was so calm and in tune with her baby. (I was a mere 19 years old at the time so I though she was pretty cool). Katy, I can so relate. I heard of so many women who got pregnant right after the workshop, or pregnant as soon as they made reservations to attend the workshop, or even as soon as they read the last chapter of “Inconceivable” and downed a shot of wheatgrass. I thought I, too, would be one of them. A year in, I’m not. And it makes me not just angry, but filled with doubt what I’m doing. My RE told me, “The one rule in fertility is if you try something and it doesn’t work, try something else.” Um, yeah. Did that for ages, but bouncing around the fertility merry-go-round made me insane. I know I’m on the right path here; I’m just impatient as hell. haha Like you said, you are learning so much about yourself in this journey. I am, too. When I was upset that I wasn’t pregnant this month after really cutting through some awesome mental red tape in the past few weeks, I found some light. I realized I still haven’t tapped into some big tools I know I need, not just for the baby but for my life. Like writing, trying EFT, being more creative, making self-care more of a priority. I don’t think (most days) that the universe has this giant checklist and once I completed all of my tasks I’m rewarded with a baby . But I do think I won’t get that baby until I make more progress.